Hi. I’m Eric Kingsbury, and this is my new blog on the future. Interesting, right, but what does it mean? Many changes are small, but they’re happening on an enormous, unprecedented scale. Geologists say we live in the anthropocene now, an age in which human beings are the primary agents of change, for better and worse. And it’s just the beginning of our age; the future stretches before us to the extent that we can imagine it. Of course, some visions of the future are clouded by nightmare scenarios, and I follow these scenarios avidly. We’re facing negative, unsustainable trends in global population, ecological diversity, climate stability and more. But there are also visions of the future that are different, that leverage human creativity to re-engineer how we build, how we consume, how we interact — in sum, how we live. The way I think of it, this idea of Kiteba is a path to a variety of opportunities for a good future. From what I can tell, all positive possible futures involve some combination of the Kiteba elements. 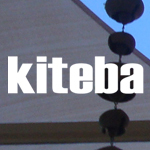 Kiteba is a kind of magic formula. Mixed with courage and determination, good, integrated Kiteba work may just mitigate the looming disaster inherent in those negative trends I mentioned above. As I develop the blog, you’ll see what I mean. Feel free to comment and share relevant content and insight.